This week's podcast features our guest Zaccai Curtis and the music of the Curtis Brothers. 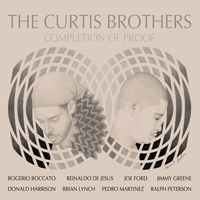 We follow the development of their latin influenced jazz from the early Insight days when the band was based on young Hartford musicians, to a more mature evolved sound of the Curtis Brothers Quartet, and finally the recently released Hard-Bop based Completion of Proof album. This latest band is comprised of some of Art Blakey's alumni (Brian Lynch, Donald Harrison, Ralph Peterson). The Blakey influence is strong, but the Zaccai's compositions maintain a subtle Latin flavor that the Curtis Brothers are so well known for. We start out the show with a Miles Davis piece, Footprints to celebrate the master's birth date. For more information on the Curtis Brothers, please check out their informative website. This special 1 hour 40 minute edition of Jazz and Beyond features Jackie McLean, and an interview with Lummie Spann, alto sax player and co-founder of New Jazz Workshop. The show begins with a tribute to JMac, who would have been 81 years old this past week. Jackie meant so much to the Hartford jazz scene, including our on-air guest. Lummie Spann joins us live in the studio to talk about his latest musical project, the release of a new CD from the New Jazz Workshop. First Lummie speaks with us about his personal experiences with JMac and his development as a jazz musician in Hartford. The show continues with more music from Art Pepper, Skerik, Trane, Esperanza, Larry Young, and Lee Morgan. We continue our World music theme with part 2 of last week's show and podcast. This week we begin with the latin rhythms of the Curtis Brothers and Flamenco music from Dave Holland. We then travel east and hear some interesting sounds from mandolin master Snehasish Mozumder. Fareed Haque, Vijay Iyer and the band Garaj Mahal show us different interpretations of Eastern influenced jazz fusion. Jazz is world music. This week (and next) we journey around the world with jazz music fused with rhythms and exotic sounds of Africa, India and Latin America. Sonny Rollins may have started the trend with his exploration of island calypso rhythms. Artists like Michele Rosewoman and Regina Carter have brought African sounds into their music, we also feature some Indian-Jazz fusion from composer Marc Rossi along with Prassana. Next week I will podcast Part 2 of this show with more world jazz.